Deciding what to talk about is a big part of interview prep. Which examples should you use? What strengths and weaknesses should you highlight? However, it’s not just about what you say — it’s about how you say it. Coming across as organized and articulate while you talk about your different experiences is critical. Going off on tangents, losing your train of thought, and wrapping up interview answers with, “and, ummm, that’s pretty much it!” could cost you the job. What we’re talking about here is the structure of your interview answers. 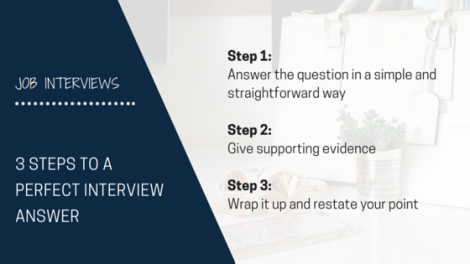 Here’s my advice on how to make your interview answers organized, polished, and impactful. Like writing, interview answers should have an opening, middle, and closing. Your opening should get right to the point and answer the question at hand! Your answer should start by begin with, “My greatest strengths are X, Y, and Z.” You are simply answering the question that was asked. If you share a few strengths but then stop talking, I’m forced to take your word on it… and no one is ever going to do that in a job interview scenario. You have to prove it — and the way you do that is by adding depth to your answer. Sharing exactly how you leveraged analytical skills will reinforce that you actually have them and show your interviewer how they made you a great asset to your team in the past. Step 3: Wrap it up! The middle part of your answers can go on for a little while. It is completely okay if you are talking for a minute or more in step 2. However, I often find that when people are done with step 2 the answer falls off a cliff and ends with, “…and, well, yup, that’s it!” That is not the strong ending you’re striving for. Once you’re ready to move on from the current question, it’s important to wrap up your answer in a nice little bow. Structuring your answers this way has many benefits. It ensures you get your point across and are actually answering the questions asked. It enables you to have answers with depth and examples that really “prove” what you’re saying. Last but not least, it gives your interviewer a heads-up that your answer is coming to a close so they have a moment to think about their next question. This helps the interview flow more organically which leaves the interviewer with a more positive impression. Hope this post helped! If you’re interested in signing up for some one on one interview prep, email me here for pricing and package information!